DO NOT START AutoCAD DRAWINGS FROM SCRATCH!!! New to AutoCAD? This is the best way to get started!! All the basic drawing setup is already done for you!! CAD titleblocks you can download NOW! 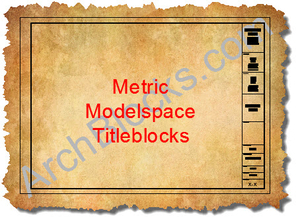 SAVE TIME with these AutoCAD format .DWG CAD Architectural titleblocks in Standard (U.S. inches) and Metric sizes. 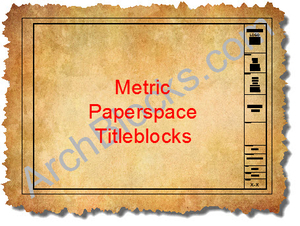 These CAD titleblocks are offered in four different products; Standard and Metric titleblocks in Modelspace, and Standard and Metric titleblocks in Paperspace. One of the hardest things to do in AutoCAD is figuring out how to set up sheet sizes for all the different plot scales. 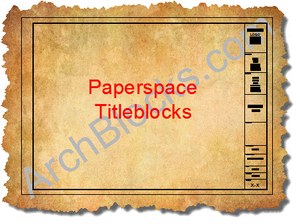 With this set of titleblocks all the hard work is done for you! All your CAD borders and titleblocks are available to you almost instantly because you can download the AutoCAD files immediately!! 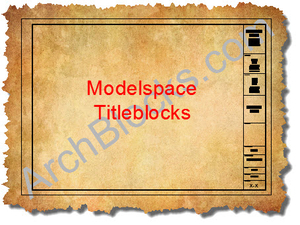 This is a basic set up, the title blocks include a basic set of premade layers in AIA CAD Layering Guidelines format (for Standard titleblocks only). Dimensions Styles, Text Styles, Limits, Units are already set up for you. There are no blocks, nested blocks, attributes, or X-ref's in these titleblocks. Just basic lines and text. They are all VERY easy to edit to fit your own personal, or company needs. DON'T WASTE TIME GETTING STARTED! ~ Download NOW!